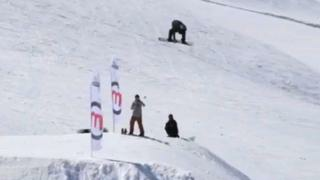 British snowboarder Billy Morgan becomes the first person to land a backside 1800 quadruple cork, in Livigno, Italy. Launching from a huge kicker, Morgan does four off-axis flips and five full rotations - that's one full flip and half a rotation more than the previous biggest trick, a Triple Cork 1620, landed by Yuki Kadano at March's US Open Slopestyle event. Team GB park and pipe rider Morgan competed in slopestyle at the 2014 Winter Olympics in Sochi and is honing new tricks ahead of Pyeongchang in 2018.